Scalculator – Guitar Edition v1.0.0 released! It’s released! Scalculator – Guitar Edition on the Android Market. This is the first release of my first Android program, and I am happy (and nervous) to put it out there! 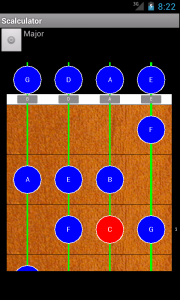 If you play guitar, bass, banjo, stick or anything similar and have an Android device – check it out! This edition is a Free-as-in-beer, ad-supported application. I have 2 more “editions” of the Scalculator planned, Keyboard and Ultimate. Once all editions are release at v1.0.0, I will add features – I have a ton of ideas, but I want to get a very basic app out there first. I’m working on this website to provide information and support for my applications. Here is a basic forum for Scalculator support – bug reports, comments, suggestions and so forth are all welcome there. I plan to release the source code for all my apps under GPLv3. I don’t use proguard or other obfuscation techniques. Right now, I have a Scalculator repository set up in GitHub, mainly because it’s integrated in the IDE I’m using (IntelliJ IDEA).